Heat roaster oven to 350°F. Combine garlic, brown sugar, honey, vinegar, Worcestershire, salt, ginger, and pepper sauce; mix well. Cut ribs to fit into insert pan without touching the sides. Coat spareribs with marinade. 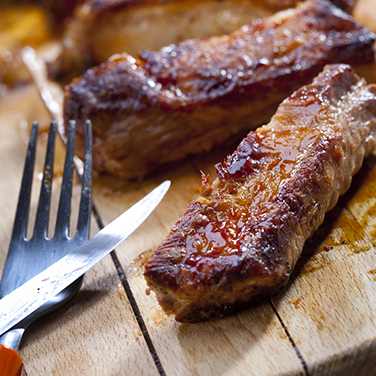 Place spareribs in insert pan and pour 1 cup of marinade over ribs. Roast for one hour. Add remaining marinade and roast an additional hour.